Mairis Briedis vs Noel Mikaelian and Krzysztof Glowacki vs Maksim Vlasov are the two Ali Trophy Cruiserweight Quarter-Finals on an incredible doubleheader when the World Boxing Super Series comes to the UIC Pavilion in Chicago on Saturday. Glowacki and Vlasov face each other for the vacant Interim WBO title while Briedis and Mikaelian compete for the WBC Diamond title. The fighters met at a press conference on Thursday in the Windy City and went head-to-head 1,353 feet in the air at the Sky Deck at the Willis Tower, USA’s second tallest building. The Polish immigrant population in the city of Chicago, at nearly 70,000 persons, is one of the largest in the United States. Maksim Vlasov is promising an interesting fight between the pair. “I think it’ll be a wonderful fight because we have two different styles; Glowacki and myself,” said Russia’s Vlasov. “Glowacki is more aggressive. He’s going to try pressing me and try to knock me out. I have a different style. I’m going to have to work around that and I think it’s going to be an interesting fight. 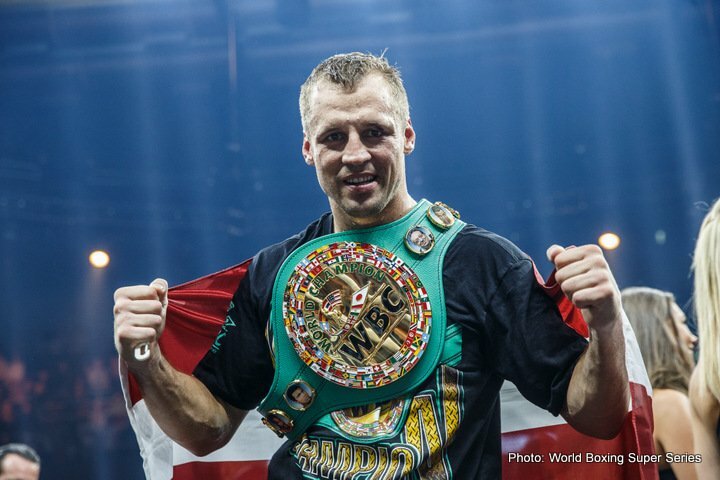 One of the stars of Season 1, Latvia’s former WBC World Champion Mairis Briedis is looking forward to another season of the best versus best. “I said before these are the eight best cruiserweight fighters and these guys are very lucky because we have a thousand fighters in this weight and just eight lucky fighters are here,” said Latvia’s Briedis. Briedis can count on hundreds of fans from the local Latvian community. “I hope a lot of Latvians come and can be heard in the arena. I want to hear Latvian voices,” he said. Germany’s Noel Mikaelian is looking forward to competing against one of the best in the cruiserweight division. “I’m really excited and glad to be part of this big tournament and I’m looking forward to the competition,” said Mikaelian. Fans in the U.S. can watch the Ali Trophy quarter-finals LIVE on DAZN, the global sports streaming platform. To sign up for a one-month free trial, fans can visit DAZN.com or download the DAZN app to their preferred connected device.